Fast foods are characterized as quick, easily accessible and cheap alternatives to home-cooked meals, according to the National Institutes of Health (NIH). They also tend to be high in saturated fat, sugar, salt and calories. According to the NIH, many fast food chains have responded to growing public awareness about nutrition by offering some food that is lower in fat and calories than their normal fare. Many people are in a hurry, which usually leaves little time to shop for and prepare meals in the same manner as their parents or grandparents might have done. Fast food outlets, a number of which offer drive-through service, fulfill a need for today's often over-scheduled society. According to the NIH, in an effort to meet the needs of more nutrition-conscience consumers, some fast food restaurants have salad bars, whole grain buns, grilled chicken and lean meats. In addition, a number of fast food restaurants will provide an information sheet on the nutritional content of the food on their menu. Despite the strides by some fast food eateries to offer a healthier menu, the NIH says many fast foods are still cooked with a large amount of oil and butter. In general, fast food restaurants are not inclined to include fruits and vegetables in their menus. 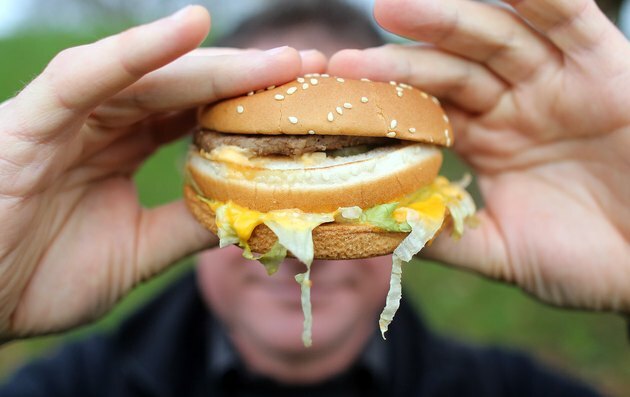 The NIH says people with heart disease, high blood pressure and diabetes must use caution when eating fast food because it tends to be high in fat, sugar and sodium. According to the American Heart Association (AHA), fast food can be good for the heart with a little planning and the willpower to see it through. The AHA recommends skipping "value" meals as well as the extras such as double meat, bacon and french fries. You can improve the nutritional value of a fast food meal by requesting a wheat bun and holding the mayonnaise and sauces. According to the the Mayo Clinic, a fast food burger was compared to a homemade burger by the USDA National Nutrient Database for Standard Reference. The report determined a negligible difference in nutritional value and calories. A 3-1/2 oz. fast food ground beef burger on white bread with ketchup, mustard, onions and pickles was 248 calories. In comparison, a 4-1/2 oz. homemade lean ground beef burger on a wheat bun with the condiments of your choice was 301 calories. The homemade burger was slightly larger and cost only a few cents less than the fast food variety.